This year, the Royal Air Force is celebrating 100 years of service to the people of Great Britain. The RAF was a completely unique organisation when it was launched in 1918, as it was the first time in history that any nation had created an air force that was completely separate from the Army and Royal Navy. It was formed as a result of the amalgamation of the Royal Naval Air Service and the Royal Flying Corps on 1st April 1918. A separate women’s air force, the WRAF, was launched on the same date. The RAF set off on its first mission on day one, when Bristol F2B fighters of the 22nd Squadron carried out strategic bombing against Germany, which hastened the end of World War I. Prior to this, Germany had the advantage in air strategies, with England suffering devastation as German flying aces, including the “Red Baron”, Manfred von Richthofen, carried out successful air raids. This had led British military leaders to push for the formation of a separate air ministry. Supporting the ground forces, the RAF gained the advantage over the Western Front. By the time the war ended in November 1918, the RAF had the upper hand across the region. With more than 22,000 aircraft, the new RAF had almost 300,000 officers, airmen and personnel, making it a driving force in Britain’s war effort. The war officially ended on 11th November 1918, when a 15 Squadron RE8 observation plane landed at Auchy at 10.45am. The crew reported that no enemy aircraft, nor anti-aircraft fire, had been seen. At 11am, it was announced fighting on the Western Front had officially come to an end and the Armistice with Germany came into force. In 1940, as the nations of continental Europe began to fall to Germany, Nazi leader Adolf Hitler was planning his invasion of Britain. The first British air attack on an enemy U-boat took place on 11th March 1940, when the U-boat was destroyed by a Blenheim aircraft. Wellington aircraft of Coastal Command carried out successful minesweeping in the Thames Estuary early in 1940. The RAF also played a vital role in Operation Dynamo, assisting with the evacuation of 316,663 troops from Dunkirk on 4th June 1940. The Battle of Britain remains one of the most significant events in British history. In July 1940, Hitler ordered the German air force, the Luftwaffe, to bomb British ports along the coast in preparation for the impending invasion. Outnumbered by their German counterparts, the brave RAF pilots resisted staunchly during the opening weeks of the Battle of Britain. This led the Luftwaffe commanders to focus all their energies on destroying the RAF planes. The plan was to wipe out the RAF (the last line of defence) in readiness for the Nazi invasion in the autumn. However, the Luftwaffe was unable to succeed against the well-organised British pilots, who resisted the German air assault for three months. Despite being outnumbered, the British fighter pilots relied on their radar technology, the manoeuvrability of their aircraft, superb organisation and their dogged determination to outwit the German air force. The famous Dambusters Raid of 17th May 1943 was also a significant point of the war. The top-secret mission saw RAF Lancaster bombers, manned by pilots from 617 Squadron, bomb the dams in Germany’s Ruhr Valley. To ensure the element of surprise, the raid was kept secret even from the pilots until 48 hours before it was due to take place – it devastated Germany’s infrastructure with the new “bouncing bombs”. In September 1952, RAF history was made when Jean Lennox Bird became the first woman to be awarded her RAF pilot’s wings. She had been flying for 20 years and had a senior commercial pilot’s licence. Assigned to No 1 Squadron, Central Flying School, the first Hawk T Mk1 aircraft went into service in November 1976. The Hawks have flown with various other RAF units ever since. The RAF Tornado GR4 was honoured for its role in liberating Kuwait in 1991 during the Gulf War. The F-35B Lightning stealth combat aircraft entered service with the RAF in 2012. Already operational from land-based airfields, it began flight trials off HMS Queen Elizabeth this year. The RAF’s world-famous display team, the Red Arrows, perform daredevil air shows all over the world in their distinctive bright red Hawk jets. Formed in 1964, with seven Gnat aircraft, the Red Arrows took their name from the two former display teams, the Black Arrows and the Red Pelicans, who combined to create the new display unit. Their first season was in 1965, when they performed a total of 65 shows throughout the year. The Gnat aircraft were replaced with the BAE Systems Hawk in 1980. Since 1983, the Red Arrows have been based at RAF Scampton in Lincolnshire – the team moved from their former base at RAF Kemble. With the Queen and other members of the royal family among spectators watching the stunning aerobatics above The Mall, the Red Arrows took part in a spectacular fly-past to celebrate the RAF’s centenary this summer. The display team plays a vital role as ambassadors for Great Britain all over the world. In 2017, there were 33,260 personnel employed by the RAF, including 4,670 women, making up 14% of the workforce. Hastily-constructed structures and B-17 Flying Fortresses house the original 100th Bomb Group. Around 4,000 US and UK nationals work at the base, with the USAF estimating it was worth $331m (£219M) to the local economy in 2013-14. 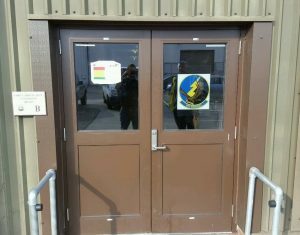 Charged with automating a pair of swing doors at RAF Mildenhall, we installed fully automatic door operators with radar sensors and on door presence sensors. By using the Swiss-built record swing door operators,we were able to achieve a safe, rapid swing door solution. Situated at 128 Piccadilly, London, membership of the Royal Airforce Club is open to men and women who hold or who have held commission in the RAF, PMRAFNS, Reserve Forces and Commonwealth and friendly foreign air forces. By automating the swing doors in the kitchen/dining area of the facilities and introducing a combination of elbow pads and foot switches, this provided easy access for waiting staff. Automatic Access manufactures and installs a range of automatic sliding doors to provide easy access to many government buildings, public buildings and commercial venues – our services comply with disability anti-discrimination laws. If you think your premises could benefit from our high-quality automatic entrance solutions, please contact us on 0116 269 5050.